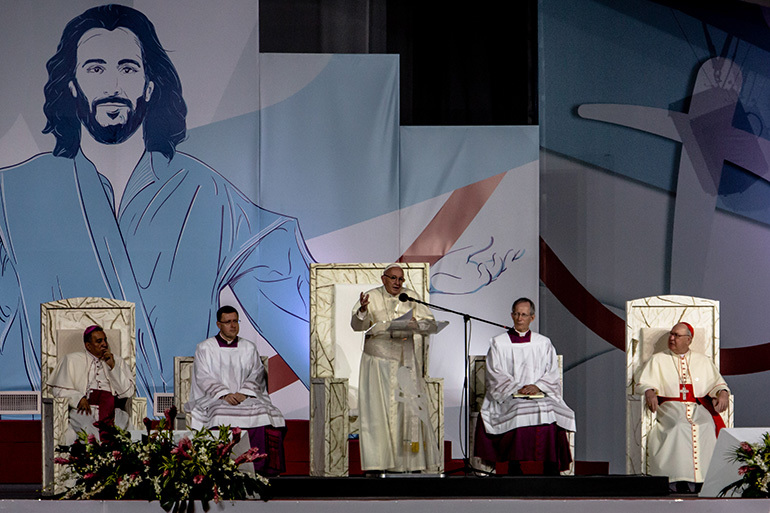 Pope Francis presides over the vigil ceremony and Eucharistic adoration with young people during World Youth Day in Panama City's Campo San Juan Pablo II, Jan. 26, 2019. VATICAN CITY | In his follow-up document to October’s youth synod, Pope Francis urged young people to approach holiness not only with the joy and boldness of youth, but with seriousness. “Along with all the other exciting things about youth, there is also the beauty of seeking ‘righteousness, faith, love and peace’ (2 Tim. 2:22). This does not involve losing anything of your spontaneity, boldness, enthusiasm and tenderness,” he said. Published April 2, Christus Vivit (Christ lives) is Pope Francis’ apostolic exhortation on the Synod of Bishops on young people, faith, and vocational discernment, which took place Oct. 3-28, 2018. It was signed March 25, the Solemnity of the Annunciation, in the Holy House of Mary in Loreto, Italy. 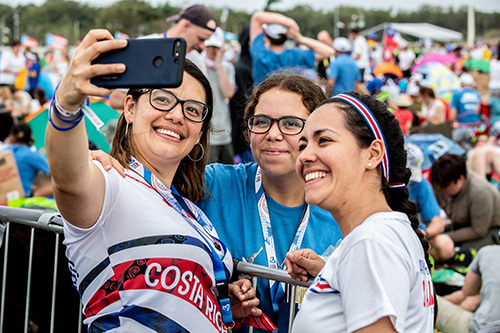 Pilgrims await Pope Francis' arrival in Panama City's Campo San Juan Pablo II for the Vigil ceremony at the 2019 World Youth Day, Jan. 26. Pope Francis also reflected on the contribution young people can make to the renewal of the Catholic Church through evangelization and community. If called to marriage, for example, having a family “is worth your every effort,” he said.